Escaping Utopia (Routledge, 2017), which I co-authored, tells the stories of 65 people from 39 different cults in more than a dozen countries. My co-author, sociologist Janja Lalich, PhD, is an internationally renowned expert on cults, indoctrination, extremist groups, and terrorist groups, and she is a cult survivor. So am I.
Janja’s work on cults is groundbreaking because she knows cults from the inside out, and she shows that a cult is simply a social group using everyday social behaviors that get out of hand. Cults can be any size, and they can be focused on all kinds of beliefs or ideas, such as saving the world. Knowing more about cults will help you understand more about how humans build relationships and groups of every kind. 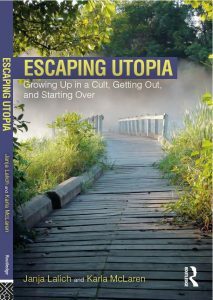 Janja and I wrote Escaping Utopia to help you become aware of cults and unhealthy groups wherever they may be. Janja developed a brilliant way to explain cults with her bounded choice model. In this model, she shows that cult members aren’t out of their minds; they’re usually idealists who want to change the world. Cults and cult leaders take advantage of their members’ idealistic dedication, but they turn all of it toward the cult’s own needs. I’ll focus on each of these dimensions and help you identify whether they’re active in your relationships, or in any group you belong to. I’ll also help you understand whether these dimensions are being used in healthy or unhealthy ways. In my previous post, I focused on charismatic authority figures. Today, we’ll look at transcendent belief systems. What is a transcendent belief system? For centuries, people have asked “What is the meaning of life? What is my purpose? Why am I here?” Through the ages, these questions have led philosophers, religious scholars, and artists to reflect deeply, and to develop an endless number of transcendent belief systems to answer them. The concept of transcendence relates to God and gods, certainly; yet it also relates to the universe beyond our understanding, to the realm of ideas, and to concepts that we are not yet able to comprehend. In many transcendent belief systems, wonder, free-thinking, and doubt are welcomed and supported. But in the controlled and sealed-off world of cults, free-thinking and doubt are not allowed. Religions and philosophies promote many different transcendent belief systems. Each one has different answers about the meaning of life, and most will expect you to become a better person as you grow to understand the belief system. In stark contrast, in many cults, your purpose is to become a perfect person: a perfect, unquestioning, fiercely dedicated, and doubt-free devotee. Though not all groups organize themselves around transcendent beliefs in a higher power or higher purpose, groups nearly always unite around their support for the right ideas, the right approaches, and the right kinds of people. For instance, most clubs and interest groups promote the right ways to eat, sing, knit, exercise, vote, or parent children (etc.). An idea is transcendent when its followers treat it as the be-all and end-all; a transcendent belief doesn’t have to involve gods or spirituality at all. For instance, top executives at Enron (an energy company that rose to great power and wealth and then failed disastrously) passionately promoted the belief that they were changing the very face of business. Everything that people at Enron did, they assured themselves, was not simply right; it was better than any other business practice that had ever been developed. The transcendent belief system at Enron became more important than individuals, than ethics, than truth, and eventually than the existence of the business itself. Transcendent belief systems can be catastrophically dangerous because their certainty and righteousness can take over a group and erase the critical abilities of everyone inside it. In healthy groups, a sense of rightness tends to be shared and supported in non-polarizing and easygoing ways. But in cultic groups like Enron and the groups Janja and I studied, the push for purity and perfection is intense and incessant. Public displays of unquestioning dedication to the group’s beliefs become a main activity that often leads to the enforced extermination of any traits, behaviors, or ideas that challenge those allegedly perfect beliefs. In the private lives of cult members, the internalization of this intense dedication often leads people to willingly suppress or even erase their own individuality. In cultic groups, these belief systems act as an ingenious form of control. When the belief system is strong enough, external forms of control may not be necessary; each member’s idealism and dedication may kick into overdrive so that they will apply increasingly stricter controls on their own behavior. The following checklists can help you identify whether a transcendent belief system is healthy, hope-filled, and supportive – or controlling, perfectionistic, self-erasing, and dehumanizing. Healthy groups with a transcendent belief system encourage critical thinking, debate, and individuality. Unhealthy cultic groups use their transcendent belief system as a form of control, and they don’t allow any questioning of their perfect beliefs. If you’re involved in any group with a transcendent belief system, you can use this checklist to gauge the health of your group. See if any of the following statements are true. The group’s sense of purpose is intense and urgent. The belief system is rigid, righteous, and exclusive; other beliefs are criticized or ridiculed. Members are expected to become perfect true believers; there is no room for doubt or questions. The belief system is the only true path and the ultimate solution. The belief system is perfectionistic, with all-or-nothing requirements that must be followed to the letter. Members are rewarded for subordinating themselves utterly and/or shedding their previous identities (family, job, home, assets, name, etc.). The group is strongly hierarchical, with an inner circle of true believers who have special access to power and privileges. Members are expected to contribute their money, their time, their resources, and their labor to the group in order to be seen as serious and loyal followers. The belief system is transmitted personally by the leader, who cannot be questioned. If the leader is deceased, this transmission may be done through writings, videos, audiotapes, or top leaders’ testimonials. The group creates internal and external enemies who are portrayed as threatening the very survival of the group. Members who question, break the rules, or leave are shunned or demonized, and may lose all contact with group members, including their own family members. If you checked yes to one or more of these statements, your group may be under the influence of a controlling and unhealthy belief system. However, this doesn’t mean that your group is dangerous, and it doesn’t mean that it’s a cult. Your group would need to have all four dimensions of bounded choice active (which includes a charismatic leader, systems of control, and systems of influence) before it could be considered a cultic group. However, if your group’s transcendent belief system feels unhealthy to you (even if the other dimensions of bounded choice aren’t present), you may be able to suggest changes and see if your group is willing to alter its troubling behaviors. 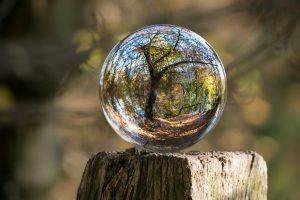 You can share the features of healthy transcendent belief systems below to help your group understand the specific ways in which it is veering toward controlling and abusive behaviors. If the group or its leader(s) can’t or won’t change, you can use the following list to find a group that provides hope and answers without rigidly enforcing its beliefs, controlling its members, or shutting out every other idea. When a transcendent belief system is healthy, people have choices. Members have the right to question, to doubt, and to think their own thoughts. The belief system makes room for other beliefs and other ideas. Members are treated as equals, and are not expected to be subordinate or perfectionistic. The belief system allows for personal autonomy, dignity, and freedom. Members retain their identities, finances, relationships, personal time, and private lives. The belief system includes rather than excludes people and ideas. Members can leave without being shunned or forced to abandon their friends and family. The belief system widens the world rather than isolating or segregating its members from it. When a transcendent belief system is unhealthy, people’s choices get tangled up with the group’s rigid vision of perfection and purity. People who are trapped in unhealthy belief systems work hard to be devoted, to live up to the group’s beliefs, and to become perfect. These actions are admirable; they require energy, intelligence, and dedication. However, because cultic belief systems are perfectionistic and unhealthy, all of this hard work and devotion only serve to exhaust and ensnare followers in a never-ending cycle. Breaking free is very difficult, but it can be done, and people can find healthy groups with healthy systems of belief. Unhealthy transcendent belief systems are very powerful; and though they can entrap and imprison people, the stories in Escaping Utopia show that people can escape. If you are or have been involved in an unhealthy belief system, it’s important to know that you, like me, Janja, and the 65 cult survivors we write about in Escaping Utopia, can get away and rebuild your life. Healthy belief systems are vital to the health of individuals, groups, and our entire world. Unhealthy ones will fade away when enough people leave. The cult I grew up in was based on New Age healing principles about reincarnation, alternative medicine, metaphysical ideas about energy, and our mediumship (our destinies), which we would discover through meditation, deep dedication to the teachings, and right living. I write about it here. At first, our transcendent belief system was delightful, exciting, challenging, and marvelous. Our leader was a medium who channeled an ancient Chinese sage, and we would hear the most wonderful things about life, health, reincarnation, healing, and magic. His belief system became ours, and we all felt special, chosen, and excited. He told us that we had reincarnated together in many lifetimes, and that now we were here to bring healing energy to the entire world. I was 10 years old when we first joined the group (with my mom and my siblings), and these beliefs and this community helped me make sense of my extensive early childhood trauma (now seen as a part of my karmic work), my ability to dissociate at will (now seen as a spiritual skill), and my hyper-empathy (ditto). I wasn’t a hyperactive, enraged, out of control, boundary-impaired trauma victim in that group; they saw the genius in me and gave me a deep life purpose. That was magical. When I was seventeen, about sixty of our group moved to Southern California to create businesses that would help us live out our spiritual visions and mediumships. We organized our money, our ideas, and our lives — and we began to create a world where we could all share our gifts, make a meaningful living, and finally, fit in. The problem was this: Our fitting in was soon achieved at the expense of our individuality. Though our group’s teachings certainly didn’t start out this way, they slowly changed from the sharing of unusual wisdom to essentially telling us how to live in painstaking detail. In a very short time after I arrived in Southern California, the women had to abide by a sexist dress code, celibacy was urged for the unmarried among us (and definitely for the lesbian and gay people), we were asked not to speak to friends or family members who didn’t support our vision, and we received a great deal of strange dietary advice (fasting, specific herbal concoctions, balancing the acidity and alkalinity of meals, mega-doses of vitamins, etc.). Our adherence to these strict beliefs became the yardstick by which our dedication and suitability were measured. People did not see conventional doctors, bizarre eating plans were followed to the letter (some children became ill because they were essentially being starved), and we all began to willingly erase our own individuality. But I couldn’t do that, so they threw me out. I was seventeen, I had no money, no job, no car, and no place to go. These people once loved me, but that didn’t matter. Their transcendent belief system became more important than anyone or anything else. If your transcendent belief system demands that you become a perfect devotee, condemn all other beliefs, and exile people, can that system ever truly be called transcendent? May we all learn how to think and believe for ourselves. May we all become ethical and empathic individuals in a world full of fierce certainty. [i] Emile Durkheim’s The Elementary Forms of the Religious Life (New York: The Free Press, 1915) is the classic sociological study of religion and cults. He wrote: “In reality, a cult is not a simple group of ritual precautions which a man is held to take in certain circumstances; it is a system of diverse rites, festivals, and ceremonies which all have this characteristic, that they reappear periodically. They fulfill the need which the believer feels of strengthening and reaffirming, at regular intervals of time, the bond which unites him to the sacred beings upon which he depends” (p. 80). [ii] See D. Tourish and N. Vatcha, “Charismatic Leadership and Corporate Cultism at Enron: The Elimination of Dissent, The Promotion of Conformity and Organizational Collapse,” Leadership 1, No. 4 (2005): 455-80.